Neotron, an accredited laboratory, conducted a study in order to compare the performance of CDR FoodLab® ’s method with NGD and ISO methods used to determine the level of soaps, Peroxide Value (PV) and Free Fatty Acid (FFA) in an oil matrices. CDR FoodLab® ’s method used to determine the Free Fatty Acid (FFA), Peroxide Value (PV) and soaps in oils and fats is available also in the following systems: CDR OxiTester, CDR FoodLab®, CDR PalmoilTester and CDR WineLab®. 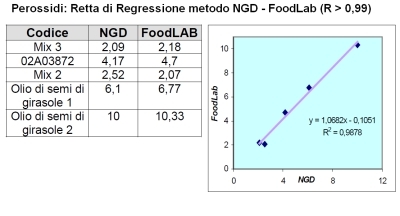 Download the document posted by Neotron “Comparison between CDR FoodLab® ’s and NGD Methods“. Validation of the Effectiveness of CDR FoodLab® in Determining the Level of Soaps, FFA and Peroxide Value was last modified: May 3rd, 2017 by CDR s.r.l.